For the frequency range from 5.7 to 5.8 GHz, a horn radiator as the primary radiator is the best choice. The purchase of a horn radiator, however, is not recommended because of the outrageous prices that are demanded. Alternatively, various other antennas (mostly logarithmic-periodic with or without reflector) can be used for this WLAN band, but with less antenna gain. 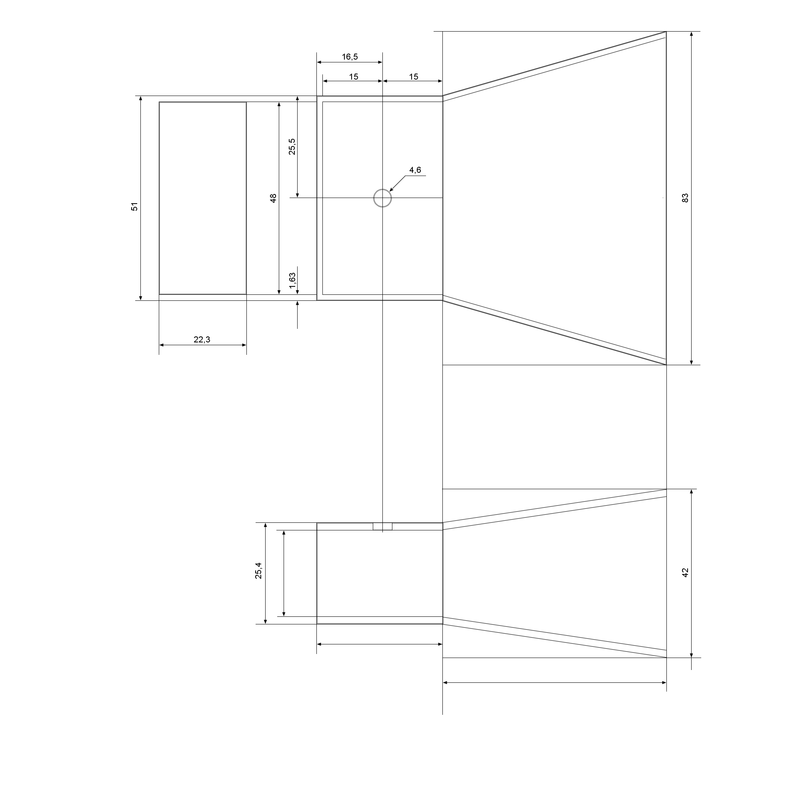 First you should make yourself a small drawing, how the horn radiator should look like. 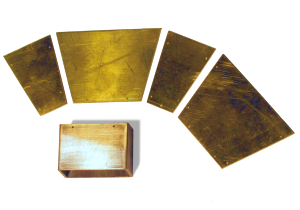 I can also offer a small graphic, how the dimensions of my sample look like, but that always depends on which type of waveguide you find or which rectangular tube made of brass (e.g. : 50x25x2 mm) you can buy on the internet instead. The output values are the wavelength used: 5.8 GHz correspond to about 51 mm in free space. But be careful! Inside the waveguide this frequency has a different wavelength! For differentiation I mention the wavelength in the free space λ0 and the wavelength in the waveguide λH. The calculation of the wavelength in the waveguide depends on the dimensions of the waveguide. 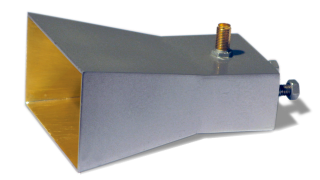 The waveguide I use (WR 187) has a wavelength of λH= 60.3 mm for the highest WLAN frequency of 5.875 GHz. I have chosen the dimensions of the horn radiator only according to the principle that the length of the horn radiator should be considerably longer than the wavelength. In my example, this is only very close to a wavelength, but it should only clarify the principle. I have chosen the size of the aperture so that the dimensions a and b of the waveguide section are doubled. All these values are not optimal and should be changed individually. I have chosen the length of the waveguide section with ½ λH.  This results in a length of 30.1 mm for this type of waveguide. 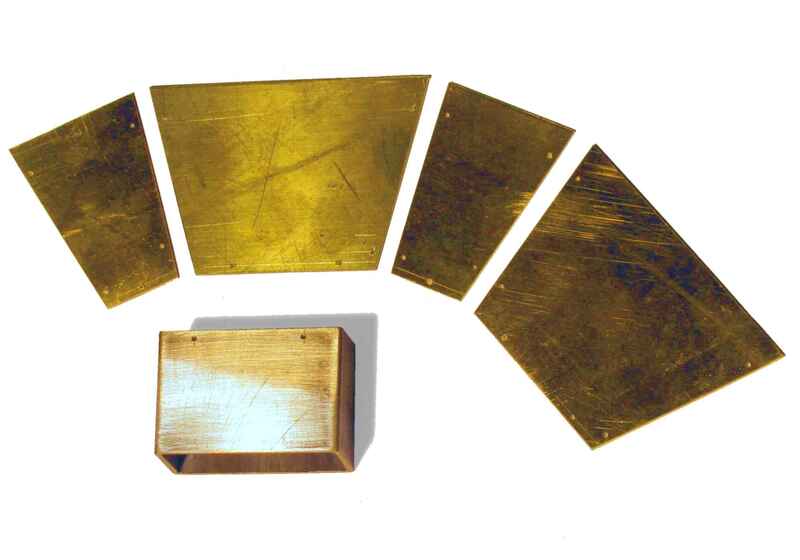 From the brass sheet two pairs of equal isosceles trapezes are cut out, which become the walls of the horn radiator (see picture 3). The length of the horn radiator should be longer than the wavelength, but not too long, otherwise a mounting in front of a parabolic mirror becomes very unwieldy. In my case I chose 60 mm, because the strip had just this width.  The opening of the horn radiator (the longest side of the trapeze) was twice as big as the one given by the waveguide section. The edges could be chamfered... but that's much too much work. For the longer side “a” I simply used the outer dimension of the waveguide, for the shorter side “b” the inner dimension. Those who can solder hard should do this, those who cannot: must solder soft. Soft soldering of such large surfaces is difficult. The power of the soldering iron is always too small to be able to solder these sheets from its own heat and at the same time to heat up the whole structure so that it does not warp. 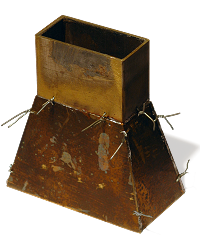 The sheet metal is therefore heated by a hot-air dryer or a propane gas burner to a temperature that the soldering iron then only has to supplement locally. All surfaces and joint edges, which are to be soldered together later, are already tinned in preparation. As long as the tin is still liquid, wipe off excess tin with an old cloth. The trapezes get holes of about 1 mm diameter at the edges. Here, these trapezes are dumbled together with the flower wire and soldered. The holes should only be drilled after tinning, otherwise they are quickly soldered again. These holes should be positioned very carefully: on the long side the flower wire forms a stop for the side parts through these holes. Copper wire is not very suitable because copper expands and does not provide stability. Flower wire is made of steel and can be bred very easily. It is recommended to solder in two steps: first the trapezes are soldered together. As an aid I have sawn a suitable rectangular window into a thicker aluminium sheet so that the trapezes are perpendicular to each other. After cooling the surface can now be filed to the waveguide section. (Don't forget: after filing, tin these surfaces.) Now rub up the waveguide section. After the complete soldering, i.e. after the final assembly, this steel wire can be pulled out again with pliers. The simplest version was also chosen for feeding the energy from the cable into the waveguide section. In Figure 6, dimension “c” is the thickness of the waveguide material. From an SMA socket with solder connection for the RG 402 cable, so much was filed off from the outer conductor that only the 2 mm material thickness of the waveguide remained. Then a piece of the cable was soldered into the socket. Now the outer conductor of the cable protruding from the socket was removed. A suitable hole was drilled into the waveguide: In the picture the dimension “d” (here: 4.6 mm), so that the SMA socket could be soldered in this hole. The hole in the waveguide should be exactly in the middle, but around ¼ λH (wavelength in the waveguide), away from the rear wall. The length of the protruding inner conductor of the cable is ¼ λ0 (wavelength in free space). Here there is theoretically a shortening factor depending on the thickness of the inner conductor. 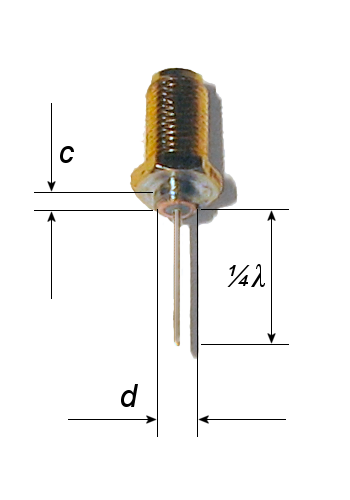 As a result, this inner conductor protrudes 12 mm into the waveguide. 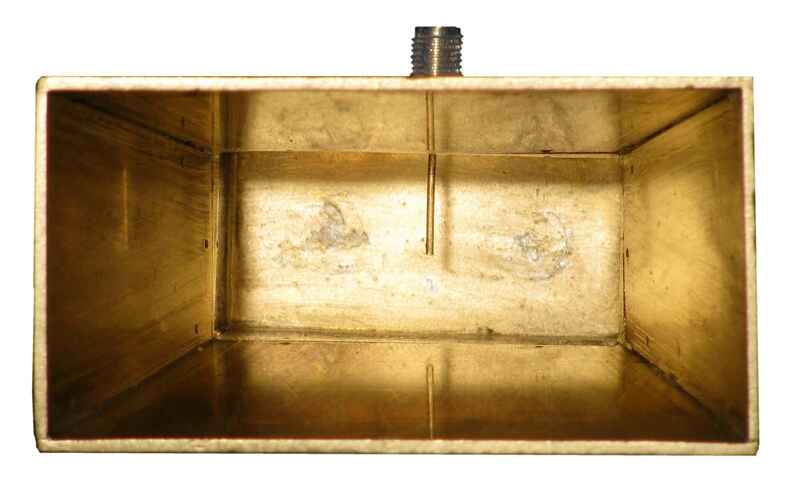 The outer conductor should be flush with the inner surface of the waveguide. The size of the rear panel fits into the waveguide section. 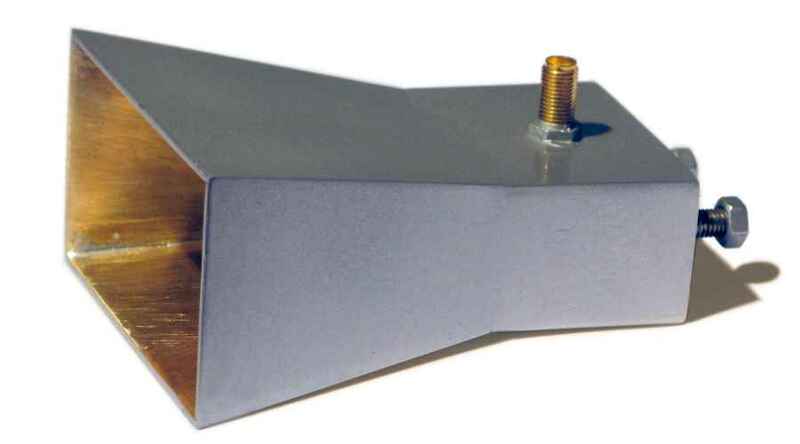 The waveguide walls are slightly bevelled with a file, so that the back wall cannot fall in during soldering. 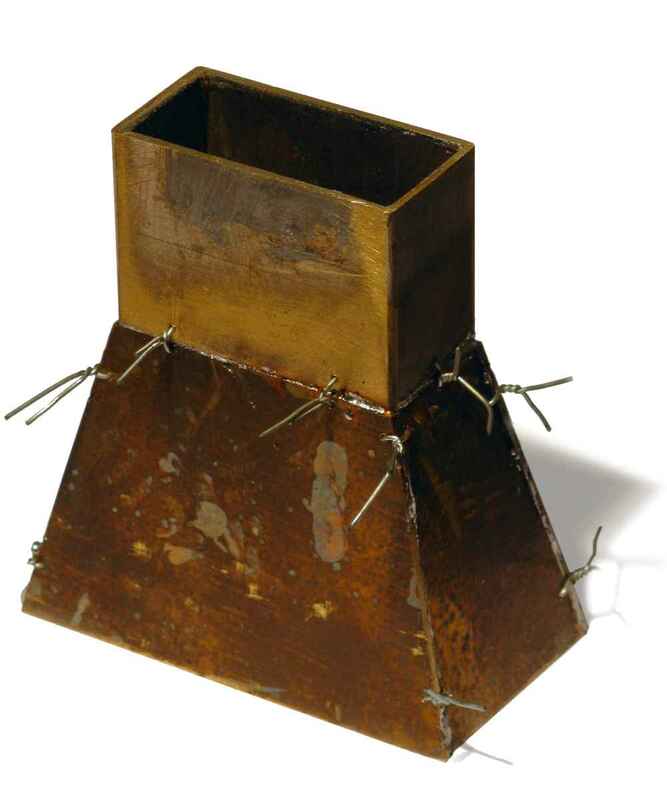 This rear panel is equipped with two M5 screws with countersunk head for later mounting of the horn radiator. These screws are held on the outside by two small grooved plates. On the inside, these screws are additionally soldered to the rear panel and then ground flat. The screw slot should be completely filled with solder. Now the single parts are turned into the horn radiator. Please make sure that the parts are not skewed to each other. It is best to solder on a refractory plate (stoneware or large floor tile). Now heat up the tattered parts with a hot-air dryer and solder them. Finally, after a short cooling, the back of the waveguide is pressed in and soldered. Since the soldering surfaces of the waveguide are already tinned, this should no longer be a problem. Only now are the wires cut off and the rest filed away. The remaining holes are much smaller than a tenth of the wavelength: thus they are electrically tight and can be ignored and lubricated with a spatula. The surfaces are cleaned with a file and brass polishing wool. The last step is to solder the socket with the quarter wave radiator: but now the soldering iron has to do this with its own heat. Since the wires are already removed, the hot-air dryer could make everything collapse like a house of cards. The grey paint from the spray can gives the horn radiator a professional external design. The likeable thing about this frequency band is that such handicrafts can simply be tested with the computer in the WLAN. As a replacement for the usual small rod antenna, this horn radiator already had a good directivity with a corresponding increase in range in this direction.